Tire chains are sold in pairs (2 chains) and will cover two tires. With the wide ranges of ATV tire tread patterns available, it can be a challenge to determine the correct chain to use on ATVs. The ATV tire chain fitment should be based on both the tire size and tread pattern. Tire size alone does not guarantee proper fitment. Call our experts at 866-437-5883, tell them your tire size, make and model of you ATV, and the chain style you are interested in, and they will ensure you get the correct tire chain to fit your ATV tire. 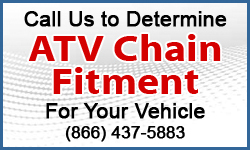 We currently have 2 styles of ATV chains available. The Quality Diamond U-Grip Studded chain, and a standard 4-link style. We also offer a wide selection of snow plows and quality winches as the perfect complement to snow chains. These items are specific to the year, make and model of your ATV, so call us at 866-427-5883 and one of our in-house experts can put the perfect plow and winch package together for you.